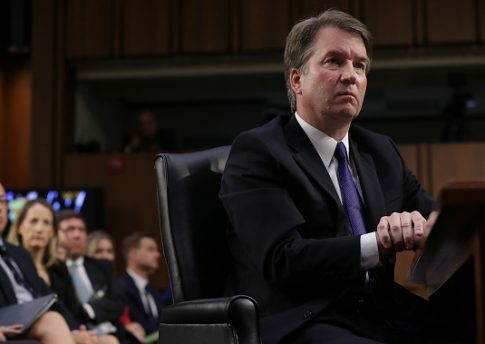 Liberals and Democratic operatives attacked Supreme Court nominee Brett Kavanaugh for not shaking hands with the father of a Parkland, Florida, school shooting victim, but video shows security intervened and escorted the nominee away. Fred Guttenberg, the father of murdered student Jaime Guttenberg, tweeted Tuesday that he approached Kavanaugh at the Senate Judiciary Committee hearing and the Trump nominee "pulled his hand back, turned his back to me and walked away," adding, "I guess he did not want to deal with the reality of gun violence." The tweet quickly ranked up thousands of retweets. The tweet was quickly spread by Democratic politicians, operatives, and liberal media figures opposed to Kavanaugh's nomination. Sen. Kamala Harris (D., Calif.), a member of the Senate Judiciary Committee, questioned how Americans could now trust the nominee to fairly treat victims of gun violence. Others questioned his judicial temperament and ability to "understand the reality of America today." Video of the incident, taken from multiple angles, shows security intervened in the discussion, placing a hand on Guttenberg and escorting Kavanaugh away. There is no indication Kavanaugh "pulled his hand away" as Guttenberg claimed. An Associated Press photojournalist also racked up thousands of retweets with a tweet that simply said "Kavanaugh did not shake his hand" with no explanation why. In the photo, the member of Kavanaugh's security who was placing his hand on Guttenberg is obscured.